Included in the same folder with this ReadMe file are over 200 modified data files that I use for aircraft that are available on the CombatAce website for First Eagles 2. I’m very pleased that we have a larger selection of aircraft for the WWI period than WOFFue or ROF – well done modders and many thanks! The installation process for the data ini modifications is now streamlined, with all versions up to 9.5 being included per theater in a large “consolidated” folder. 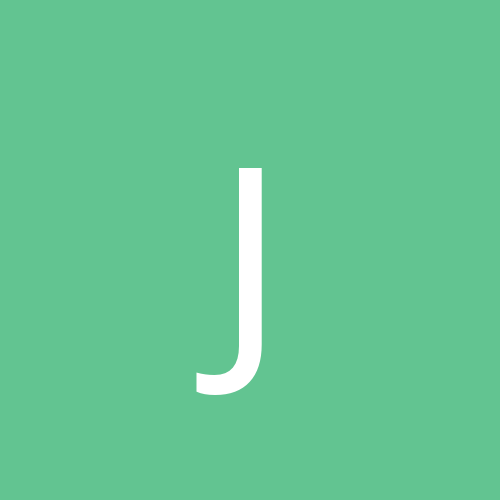 Inside that folder you will find two “Read Me” files that list a version history up to ver. 8.9, also from ver. 9.0 to 9.5, and all of the incremental mods. done to the FMs up to that point. The latest files are found per theater in a separate “DataFilesAdditionsVer97” folder. Also take note of other folders such as “ForFlightFolder,” “ForObjectsFolder,” etc., located in the latest ver. 9.7 update, and install items into the relevant folder hierarchy of your FE2 user directory. Always install older version files first before upgrading to the latest ver. FM pack (if you are missing ver. 9.5, for example, first install the files from the big consolidated folder before overwriting with the files from ver. 9.7). A great many thanks go out to Peter01 and Ojcar, also TexMurphy, for making most of those flight model files to begin with. Also a great thanks goes out to Stephen1918, MontyCZ and Laton for providing lots of beautiful planes and skins that go with those great flight models, to NBell for the many hitbox improvements provided for the planes, also to VonOben, Mike Dora and Crawford for many helpful suggestions, and to the A-Team by SkunkWorks for allowing me to tweak a few of the FMs for their models too. And of course a very big thanks goes out to Geezer for the fantastic, high-quality models that are still being made for FE2. As always, please read the included "Read Me" file for more thorough installation info. and details regarding the FM tweaks. Enjoy and happy flying! Version 1.5, Oct. 18, 2015 - Further tweaks applied to the Pfalz and Fokker Eindeckers, also to the Morane Bullets and the Dr.1. See the "Read Me" in the attached zip file for more info. Version 2.0, Oct. 24, 2015 - Nieuport 11 and 17bis added, also the Pfalz E.III (Parasol), the Fokker Eindecker Ia, and several other important modifications. See the newest "Read Me" in the attached zip for info. and instructions. Version 3.0, Nov. 22, 2015 - Several new plane types added, including the DH4, DH9, BE2 types, Nieuport 24bis, SPAD 12, other SPAD types, and Hansa-Brandenburg variants. Read the latest "Read Me" that's included for more thorough info. and installation instructions. Version 3.0a, Nov. 26, 2015 - An extra space was by error included after the INI in the Morane N (80HP) data files in the Italian, Western, and Middle Eastern theatres in the "DataFilesAdditionsVer2" folder; that problem was already solved for the 3.0 upload of Nov. 22; one or two of those Morane N data files also had an extra space in the subfolders located under "DataFilesAdditions" (which is the Ver1.5 folder), as I noticed today - that problem has now been solved too and is reflected in the latest upload. If you don't want to be troubled by manual removal of that extra space in those Morane N files, simply download the latest zipped file included here. Version 4.0, Jan. 2, 2016 - Several new plane types added, and several previous models tweaked further. Please read the included "Read Me" for more info., and also the description here on the download page (for "Ver4"). Version 5.0, Jan. 6, 2016 - Successful modifications of my previously tweaked line of Pfalz Eindeckers (their tail skids no longer get "stuck"). Also included now are a Caudron G.4 for the Middle East theatre, as well as a Nieuport 17bis for the same theatre (some of these types were in possession of the Ottoman Air Service by late '17/early '18). Please read the included and thorough "Read Me" for more info. Version 6.0, Feb. 16, 2016 - Several additions and tweaks included for the Italian Theatre, particularly the Jan Tuma line of Oeffag Albatroses. Please look over the included "Read Me" for more thorough info. regarding tweaks and added aircraft. Version 6.5, Feb. 27, 2016 - Includes corrections to top speeds for the Fokker E.Ia and IIa, and for the Fokker D.7 and BMW-powered D.7. Also to be found in the latest version are early Fokker types such as the B.I and B.II, in the relevant theatres. Please read the relevant version section of the updated and included "Read Me" for more thorough info. on the latest additions. Version 6.9, Mar. 10, 2016 - Includes corrections to the top speeds of the Fokker Dr.1 for the Western theatre and addition of one more Dr.1 power plant variant besides the Jacobs one, also a Nieuport 10 in the relevant theatres. The "enhanced" Dr.1s are now standalone installs, allowing more than one variant to show up in game at the same time, also in the game menu. Please check over the relevant section of the "Read Me" file for more detailed info. on the latest additions. Version 7.0, Apr. 14, 2016 - Includes several modifications, such as a new, separate folder for the Morane-Saulnier I in the Eastern theatre, shorter service dates for the Russian Morane-Saulnier N that has now been included there too, a separate folder for the Pfalz E.II in the relevant theatres, more realistic service ceilings for the early parasol and mid-wing types by Morane-Saulnier and Pfalz, addition of the Sopwith Tabloid and early Martinsyde for the Middle Eastern theatre, also the late-war 375HP DH.4 for the Western theatre and Lebed 12 for the Eastern theatre. As well included are hitbox improvements by NBell in the relevant data ini files and pilot skin changes for some of the earlier monoplane types. Please read the relevant section for "Ver7" of the included "Read Me" file for more detailed info. regarding tweaks and added aircraft. Version 7.5, May 6, 2016 - Includes several more hitbox improvements for relevant types, done by NBell. Also included are tweaks to the DH.2, corrections to the early Martinsyde, tweaks to the Halb. D.5, addition of a general "aircraftaidata" ini file for your objects folder to help with early monoplane types, and the addition of four new aircraft, the Martinsyde G.102, also three seaplanes for the Flanders map - the Sopwith Baby, Hanriot D.2 and Albatros W.4. Please read the relevant section of the included "Read Me" file (now in pdf form) for more detailed info. regarding the latest additions. 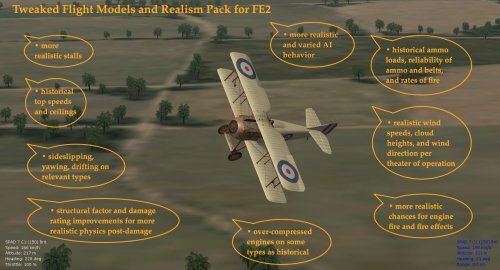 Version 7.9, May 15, 2016 - Includes several hitbox updates by NBell for relevant types, improved pilot seating for the Morane types N and I, engine exhaust fume addition for the Fokker E.IIa, further FM tweaking of the Hanriot D.I and Halb. D.V types, also the introduction of the commonly used Nieuport 17 C.1 and individual aircraft folders (per nation) for the common C.1 type, for the Western theatre. As well added is a Siemens-Schuckert D.I “mod” of the Nieu. 17 for the Eastern theatre, and further tweaks to the 17bis type added in previous versions. Please read the relevant section of the included "Read Me" file (now in pdf form) for more detailed info. regarding the latest additions. Version 8.0, June 4, 2016 - A large realism update with historical rates of fire, realistic ammo. 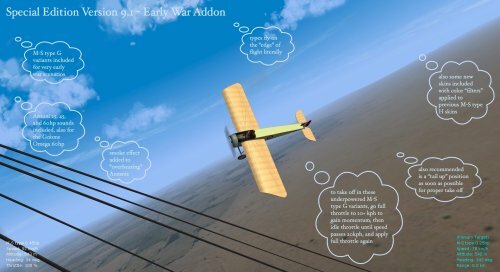 loads, re-linked data ini files that correspond with the gun expansions, also new sounds, a reworked hud display, new hitbox improvements by NBell, and some tweaks to engine exhaust and fire location on the Fokker Eindeckers, including more historical ceilings for later Nieuport types and Camels. Please read the relevant section of the included "Read Me" file for more detailed info. and installation instructions. Version 8.5, Aug. 30, 2016 - A few new plane types added (Fokk. E.IV, the late Nieu. 16 with Vickers, an early "radiator ears" Alb. D.II, the BE12 and 12a types), the Halb. D.V further tuned, and other tweaks such as a modified general aircraft ai data ini file included. Please consult the relevant section of the included "Read Me" file for more detailed info. and installation instructions. Version 8.6, Dec. 25, 2016 - A few new plane types added (Nieu. 17 Lewis, Nieu. 23 Lewis, Nieu. 23bis, Nieu. 12), structural aspects improved on Morane monoplanes and the Nieuport family (damage rating, maxg limits, etc. ), and other modifications included to help improve engine fire chances, also environmental tweaks for realistic cloud heights and better frame rates on low-end/integrated graphics cards. Please consult the relevant section of the included "Read Me" file for more thorough info. and detailed installation instructions. Version 8.7, Feb. 5, 2017 - Farman types added, also MaxG limits for lift surfaces, and where relevant damage rating and structural factor tweaks, also ailerons/elevator/rudder tuning, across the Albatros line, the SPADs, Hanriots, early Parasol and mid-wing types (Morane, Fokker, and Pfalz), and the later Fokker types too. Tweaked parachute effects are also included. Please consult the relevant section of the included "Read Me" file for more info. and detailed installation instructions. Version 8.9, June 16, 2017 - A few new planes added (200HP Alb. D.Va, Spandau-armed Fokk. E.II, Etrich Taube, early Morane Parasol types), also MaxG limits for lift surfaces, and damage rating and structural factor tweaks implemented across the rest of the data inis. 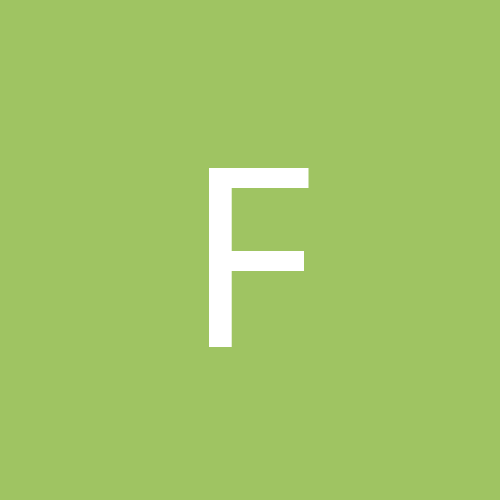 Further FM updates to the Farman and Anatra types, and Halb. D.V, are included. As well added are modifications to wind speeds, for greater realism, and changes to wind speed sounds and speeds in the aircraft object ini file, for greater immersion and spotting of differences between indicated airspeed and speed relative to ground. New wind/stall sounds are included, also new sounds for the 100 and 200HP (auv) Mercedes engines. Please consult the included "Read Me" file for more thorough info. and installation instructions. Version 9.0, Nov. 1, 2017 - Several planes added, such as the Gothas, the HP 0/400 (now player-flown), also player-flown SPAD 7 types, including by Dux for the Eastern front and Mann-Egerton built ones for the British in Mesopotamia and the Western front; also included is correct over-compression of the engines on the Viper-powered Se5a, the Ansaldo SVA.5, the 235hp variant of the SPAD 13, as well as the previously tweaked over-compression on the Alb. D.Va (200hp), Fokk. D.VIIf, AEG. G.IV, and the Pfalz Dr.1 (the Gothas III, IV, and V also feature subtle over-compression); also added are further tweaks to ailerons/elevators/rudders across the SPAD single-seater line, a couple of new engine sounds, larger sun size in the environsys files across the weather/wind types, and a simplified installation process with all previous versions being updated to 8.9 in a large, "consolidated" folder, and the ver. 9.0 tweaks featured in a separate folder. As always, please consult the included "Read Me" file for more thorough installation info., and more details about the FM tweaks. 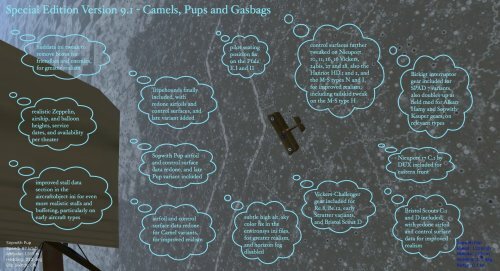 Version 9.1 Special Edition (Camels, Pups and Gasbags), Jan. 4, 2018 - Several plane types added, including the Nieu. 17 C.1 Dux variant, the A-Team Sopwith Pups (80 and 100hp), Tripes (early and late), and Bristol Scouts C.1 and D variants, also several subtypes of the Morane-Saulnier type G (25, 45, 60hp Anzani), and several other improvements, including realistic heights and service dates for Zeppelins, airships, and balloons, per theater, and improved stall and buffeting data in the aircraftobject ini file, for more realistic stall effects. Also included are new gun subtypes, for the Vickers Challenger gear, Birkigt gear, and field mods of Alkan-Hamy and Sopwith-Kauper gears. As always, please follow the info. in the included "Read Me" file for a more detailed overview regarding the FM tweaks and for thorough installation instructions. Also check over the pics. included and posted with this update pack for a quick overview of what's new. 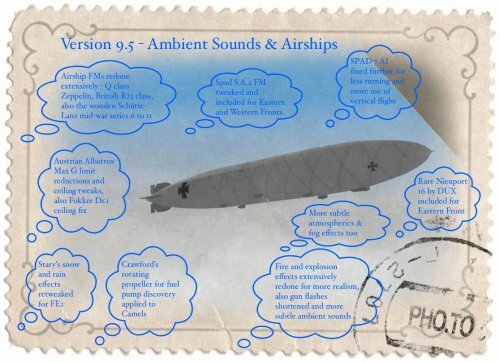 Version 9.5, June 15, 2018 - Several planes and airships added, including the mid-war Schütte-Lanz types 6 to 11, Zeppelin Q class and British R.23 type airship (all player-flown), the Spad A.2 110hp and "retrofitted" 80hp variants, the Lebed 7 (unlicensed Tabloid copy), an obscure, lower-compression 210-220hp variant of the Spad 7 possibly flown by Rudolf Windisch, a very rare Nieuport 16 for the eastern front (possibly DUX-built), lower-flying Zepps and R.23 type airships for the GroundObjects folder, new fire, explosion, and gun fire and smoke effects, reworked snow and rain effects by Stary, high- and low-variant cloud effects, new ambient sounds (more subtle), and other tweaks as explained in the included "Read Me" file. Please look over that file, and the included pic. of the ver. 9.5 FM updates, for more info. regarding what's new. 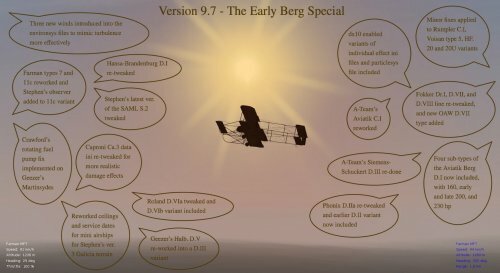 Version 9.7 (The Early Berg Special), Feb. 9, 2019 - Several tweaks re-applied to the Rumpler C.1, the HF.20 and 20u variants, also the Voisan type 5. As well included are three new winds for the environsys files, to mimic more realistic turbulence effects hopefully. Also included is Crawford's rotating fuel pump trick for Geezer's Martinsydes. More major tweaks include reworking of the early Farmans, types 7 and 11c, of the Caproni Ca.3, of the entire line of Fokker Dr.I, D.VII, and D.VIII aircraft, including the addition of an OAW variant of the Fokk. D.VII. Further, now included is a transformation of Geezer's Halb. D.V into a D.III variant, a reworked Aviatik C.I from the A-Team, also of their Siemens-Schuckert D.III. Stephen's latest SAML S.2 has been tweaked as well. Also tweaked is the Roland D.VIa, and a new engined-up type, the D.VIb variant. Four sub-variants of the Aviatik Berg D.I are now included (160 hp, early and late 200 hp, and 230 hp). The Phonix D.IIa has been re-tweaked, and the earlier D.II variant is now included too. Have also re-visited and re-tweaked the Hansa-Brandenburg D.I. For more detailed info. and installation instructions, and other updates not mentioned here, please look over the latest READ ME file that's located in the update pack, and also the included pic. of the ver. 9.7 FM updates. Happy flying to all.